I have already made these pretzels 3 times in this month! Their texture and flavor are very much like the New-York style pretzel, which is my family's favorite! Many, many years ago my then boyfriend (now husband) and I were the regular customers of a bar in Stanford Hotel in Hongkong. At one time they hired a German guy to manage the bar. One of the very few good things :) :) he did was to add bread pretzel in the menu. Every time we visited, we must order a few of them. The waiters would first hang the pretzels on a tree-shape rack and deliver to our table. Their pretzels were bigger than my hand, one supposed to be able to stuff me up, but we just couldn't resist; so quite often our tree rack required "refill". After we moved to Singapore we were very lucky and able to get (good!) bread pretzel from Paulaner Brauhaus restaurant. 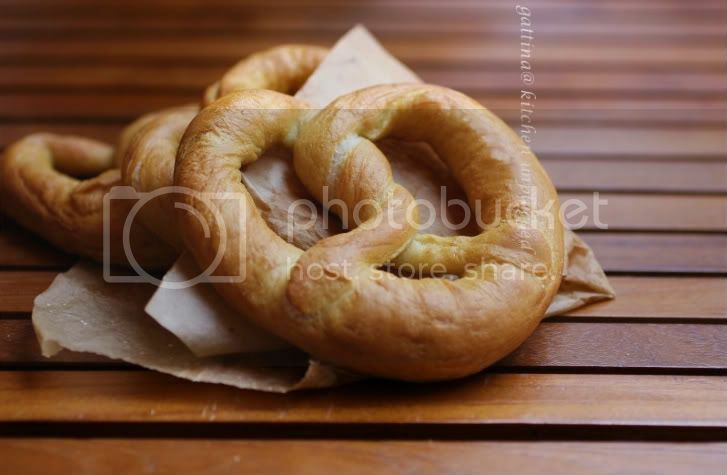 Yes, Auntie Anne's (a US chain that makes pretzel-shape baked goods) was popular in Singapore too, but we only loved the most basic lye's type, sadly AA couldn't make it any decent. Later on we lived in New Jersey, our appetite for pretzel eventually unleashed!!! Many malls, stores, supermarkets, and food vendors at parks, street fairs, bus stations, airports, and etc all sell pretzels! The quality can be very, very various though, still, considered how difficult for us to get it in Asia, we were happy to anything we had got. We can freeze the pretzels... by doing it, not to add salt on the dough and to bake them 90% done. To rehead them, no need to thaw, simply sprinkle some water on bread, then add salt, bake in medium hot oven for 3 - 5 minutes. I took a reference of this (for shaping tips) this (for soda water bath and oven's temp) recipes, although I found their proportion of flour + water very different, anyway liquid is always subject to different flour, weather, and handling. I care more about how much yeast putting into the flour, since I always do the 1st proofing in fridge overnight, I always opt for little bit less yeast. In a small bowl, dissolve the yeast and sugar with a small cup of water. Wait 5 minutes, you should see some bubbles appear on the liquid. Combine the yeast liquid, salt, 3 cups of flour and 1 cup of water, form a rough dough first. Rest dough for 5 - 10 minutes (it requires time to absorb the liquid). Then start kneading, add more flour (up to another 1/2 cup), the butter (and water if necessary). When the dough is well-kneaded, it is slightly wet (not sticky), velvety and very elastic. Turn the dough on a slightly floured work table, knead a few times, then divide into 10 small balls, cover again and rest for 15 minutes. We aim to roll each dough to be a long strip (around 53 cm), but the dough usually can't accomplish in one rolling as the gluten requires time to relax and so to extend. Therefore, your doughs need a couple of resting time in between rolling. No need to cover the doughs during the resting. For how to shape into a pretzel, kindly take Jennifer's advise. After the doughs are shaped, uncover, place them on a baking tray lined with parchment paper and rest (in room temp of 75F) for about 20 minutes or until they look very puffy. At the same time pre-heat oven 210C, and bring a big pot of water (6 cups) to boil. Once the water boils, lower the heat a bit, carefully spoon in the soda powder (spilling!!!). Boil the prezel over the medium heat, one by one, for 10 seconds on each side. Return them back on the baking tray. Rest them for another 10 minutes or so. Sprinkle the salt. Bake the pretzels until golden brown. May slightly lower the temp if they brown too quick. Baking time is about 10 minutes. Best to consume the bread on the same day. If you intend to freeze some, just not to add any salt on the dough, and take them out from oven 2 minutes earlier. After they completely cool off, wrap well and freeze. To reheat, just to sprinkle some water on the surface, add the salt, and bake in medium hot oven for 3 minutes or so. Gattina, I don't understand the split you're talking about. Where should the split be??? Nice rustic looking pretzels! yummy! I was craving these... I may need to give them a try! What a sweet photo! I made pretzels at home before and they were a hit, so good right out of the oven! I think these pretzels look absolutely perfect!! I so love the 1st picture!! hahaha! These bread pretzels look so tasty, apart & so special too! So beautiful, Gattina! 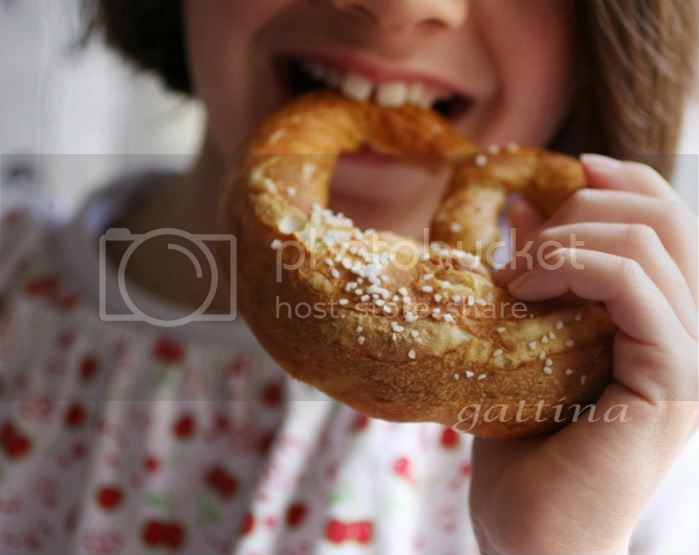 Love the photos and the pretzel! I’ve never made these before. You’ve inspired me again. ahh I haven't had pretzels in awhile! You are making me crave for some now! The pretzels that I grew up with! This is my childhood favorite!